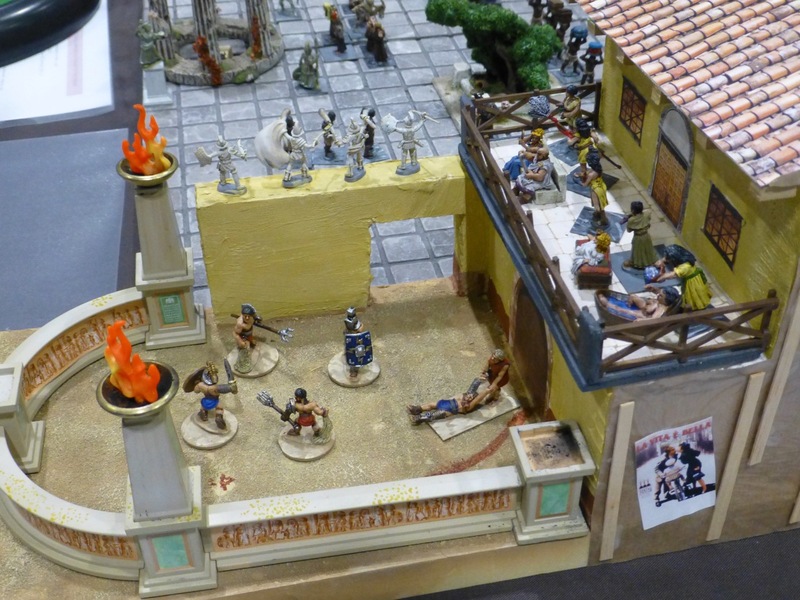 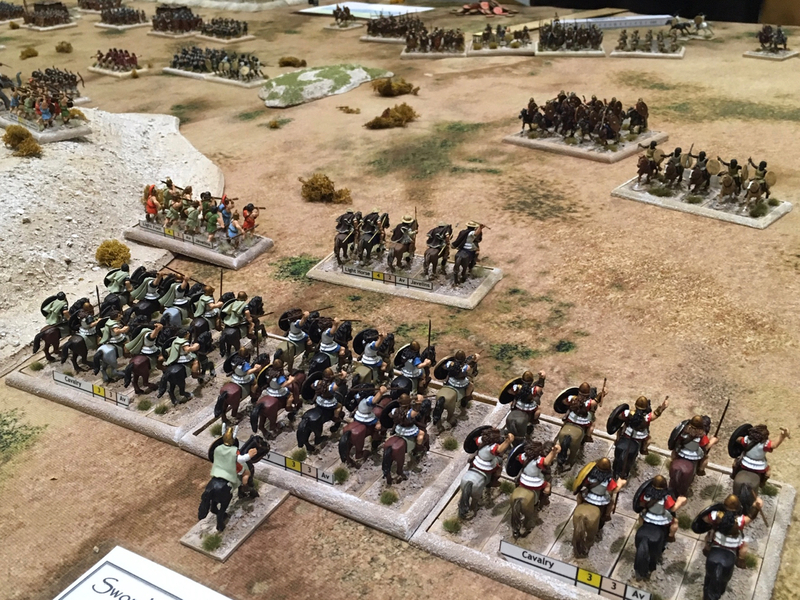 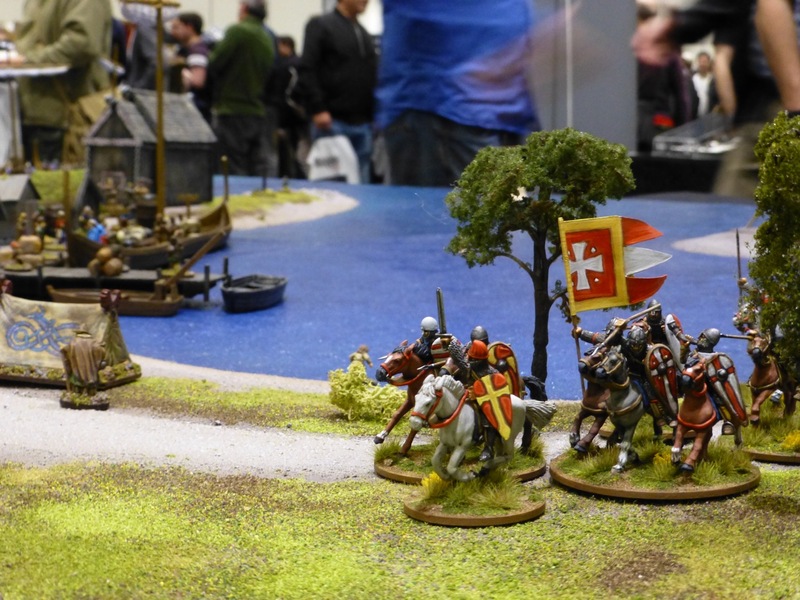 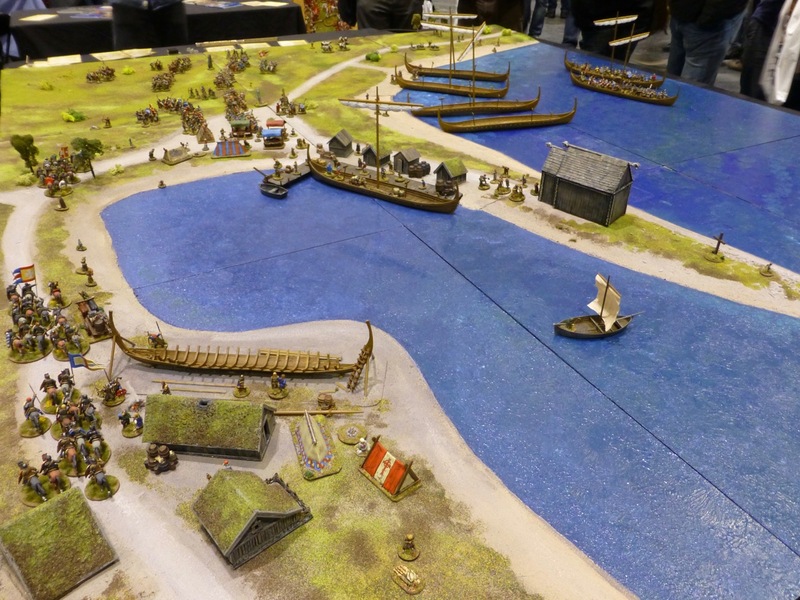 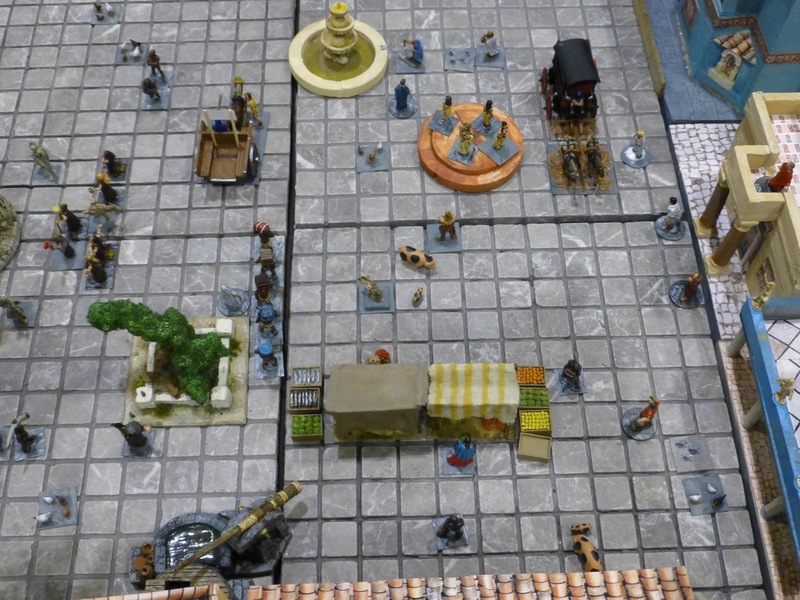 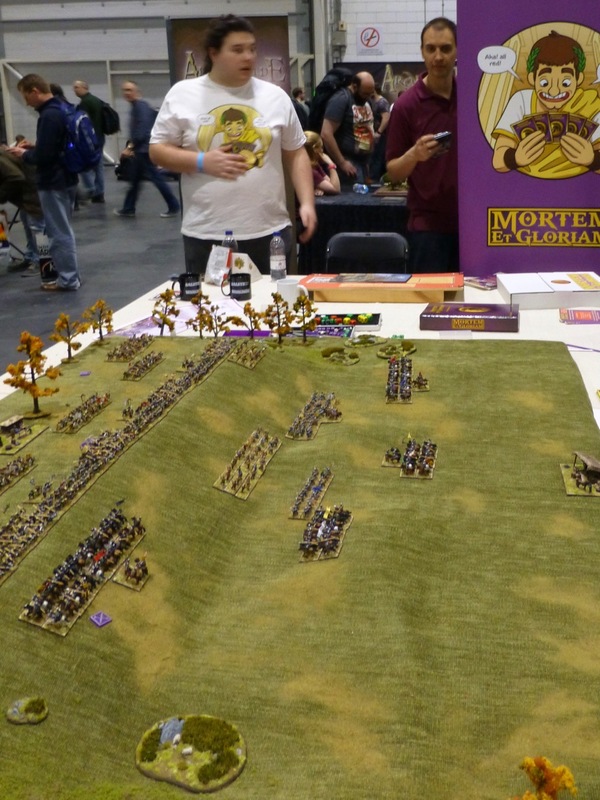 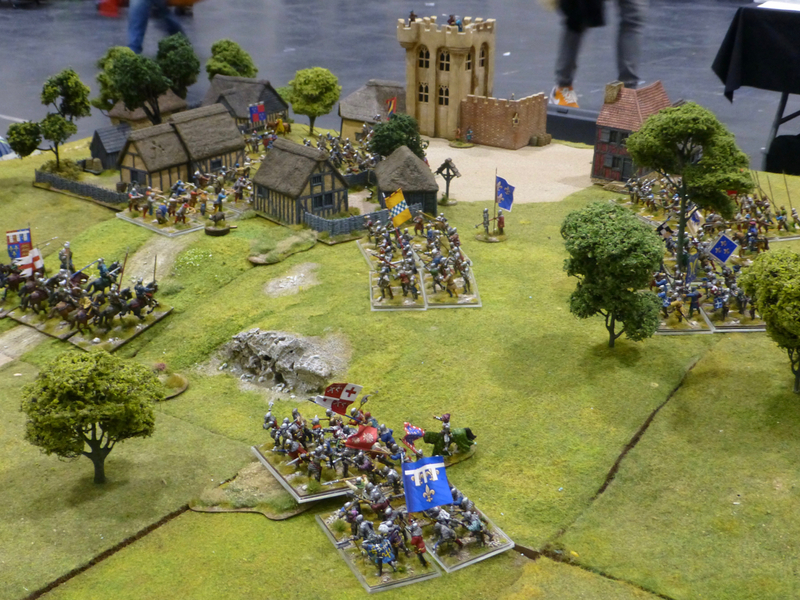 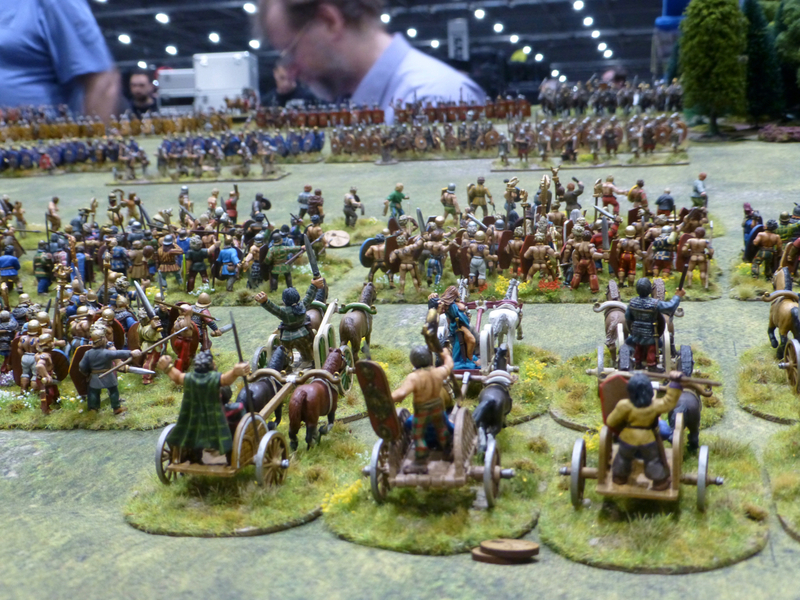 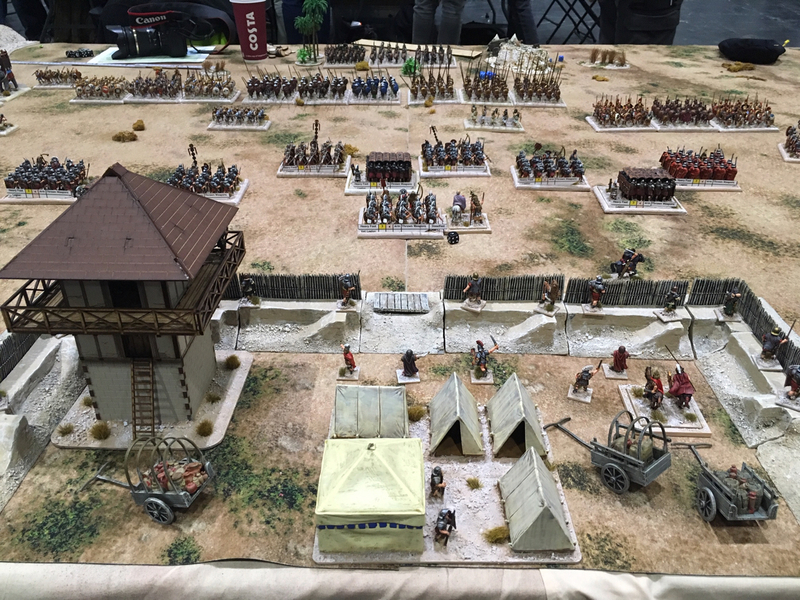 Kicking off my Salute 2019 photo reports are the Ancients & Medieval eras. 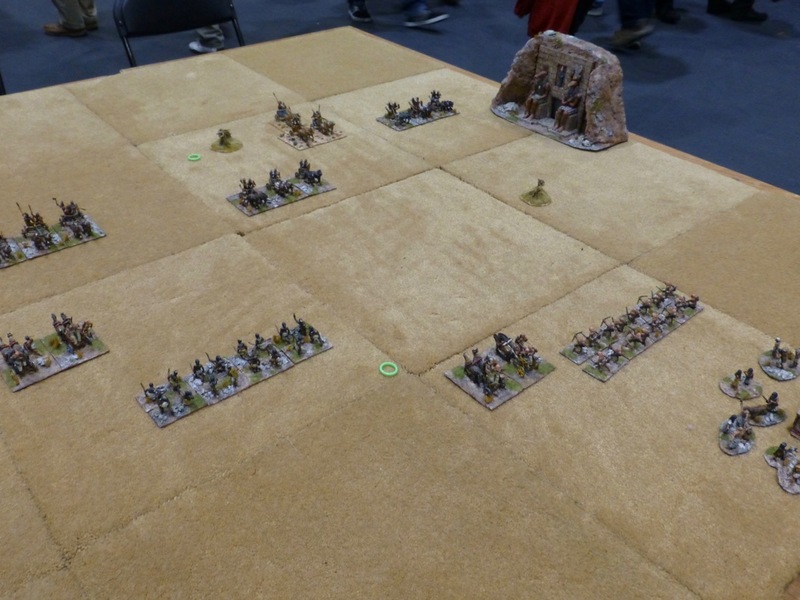 Despite a lot of space staying empty on the showroom floor this year and the crowds seeming decidedly smaller, there were a number of nice participation games for this period. 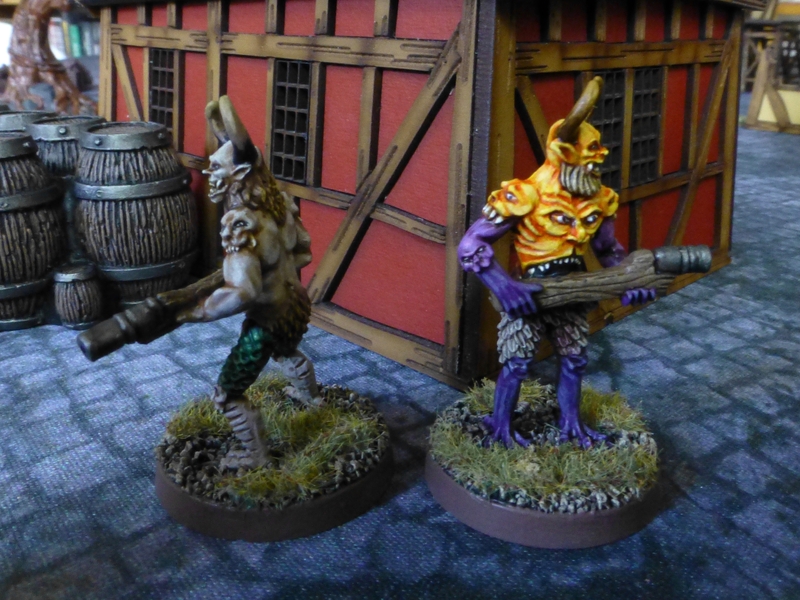 Thanks to undeadhighelf for providing additional pictures of these. 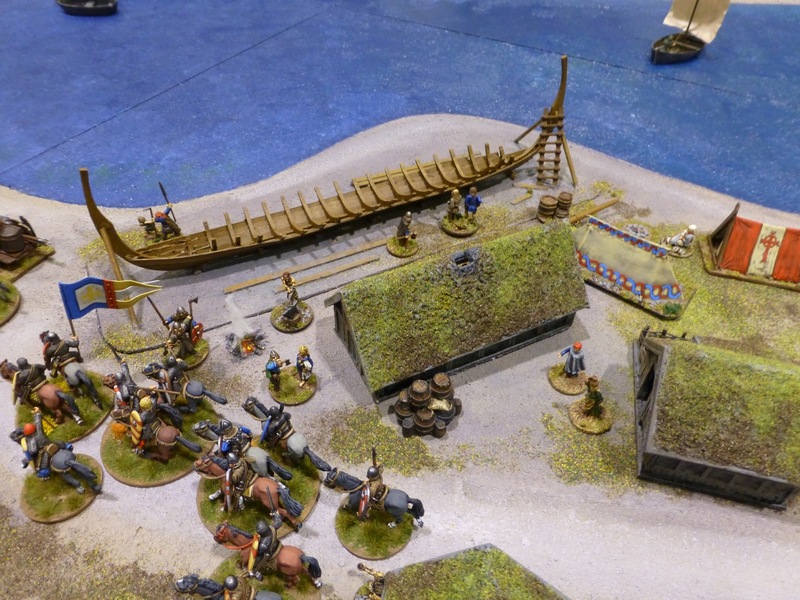 The South London Warlords put on an epic battle in an alternative history setting to determine who would triumph in a clash between ‘The Pilum and the Pike’. 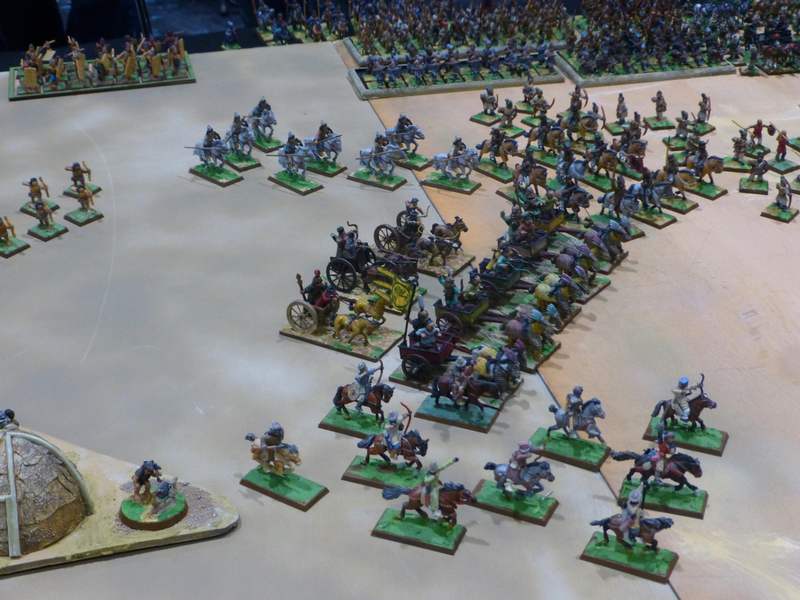 I love a good testudo nearly as much as I love a good phalanx. 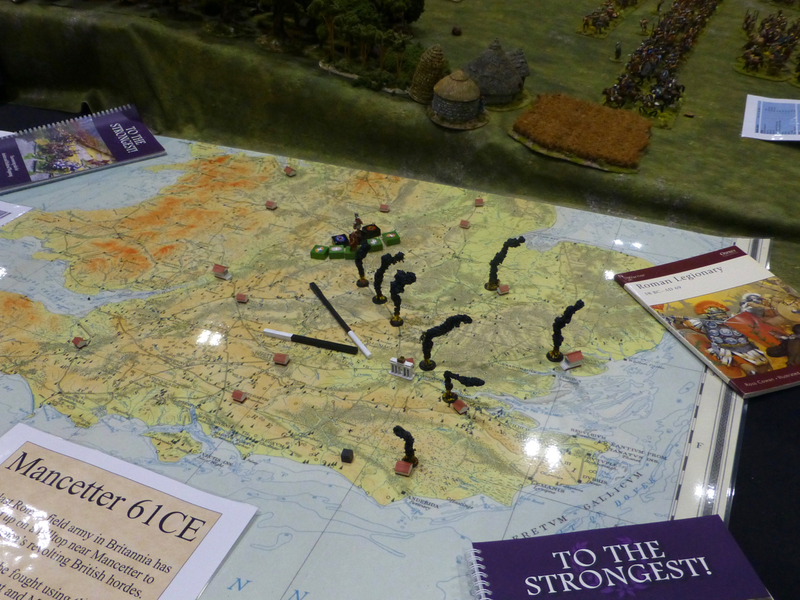 Boudicca’s revolt was the background for the battle of Mancetter 61 CE. 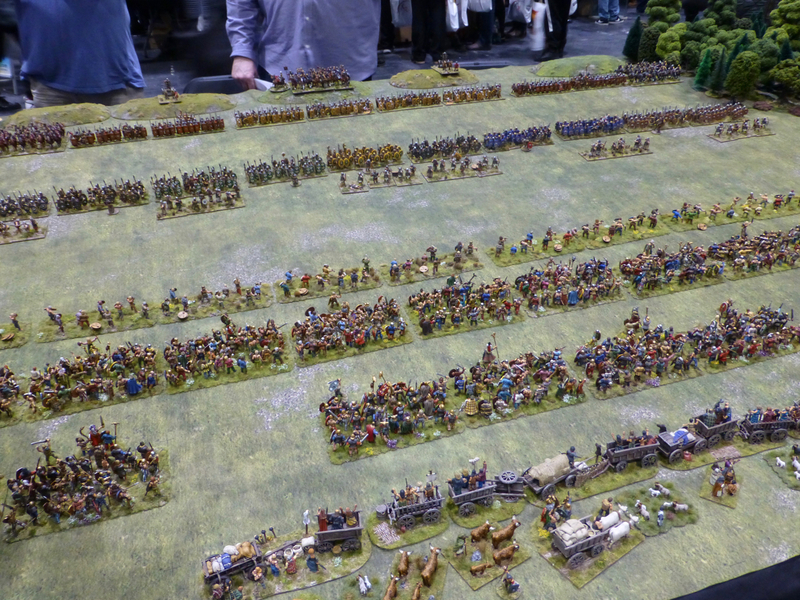 Two mighty armies of Iceni and Romans faced each other in this climactic encounter with victory promised To the Strongest! 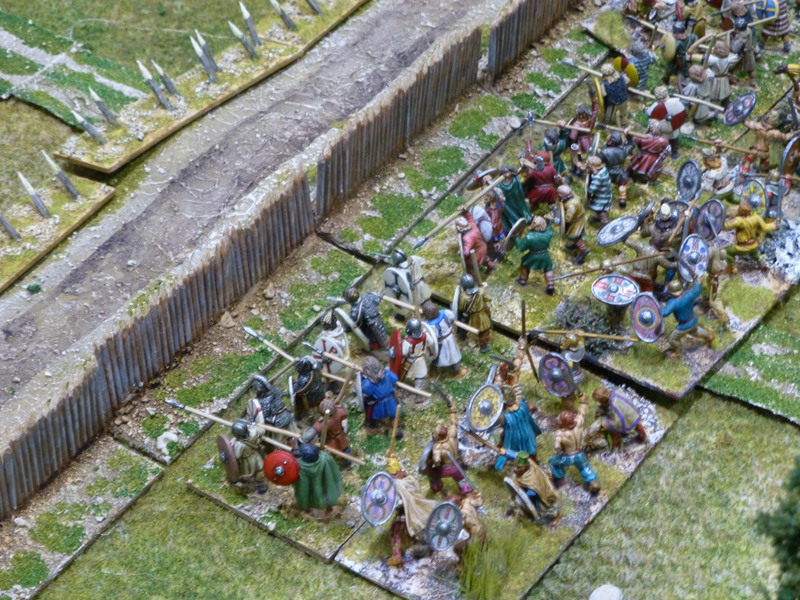 The Society of Ancients recreated the ‘Battle at the Harzhorn’, pitting Romans against Germanic tribes in the 3rd century. 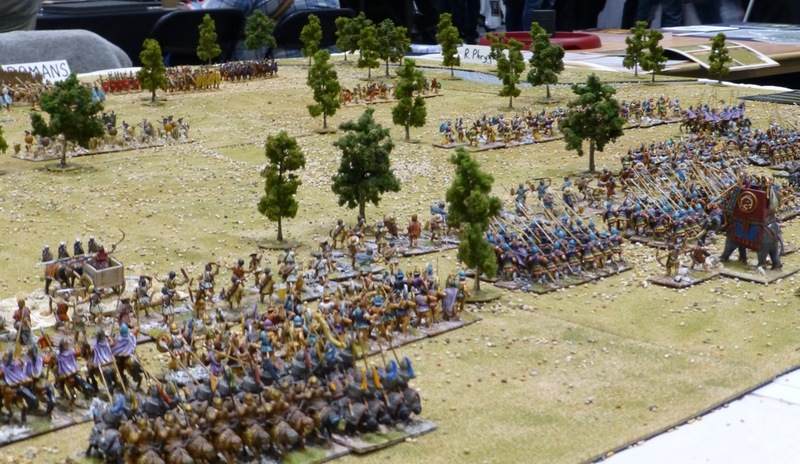 The site of this ancient battle was discovered in 2008 and is still being excavated, revealing a treasure trove of new information about the era. 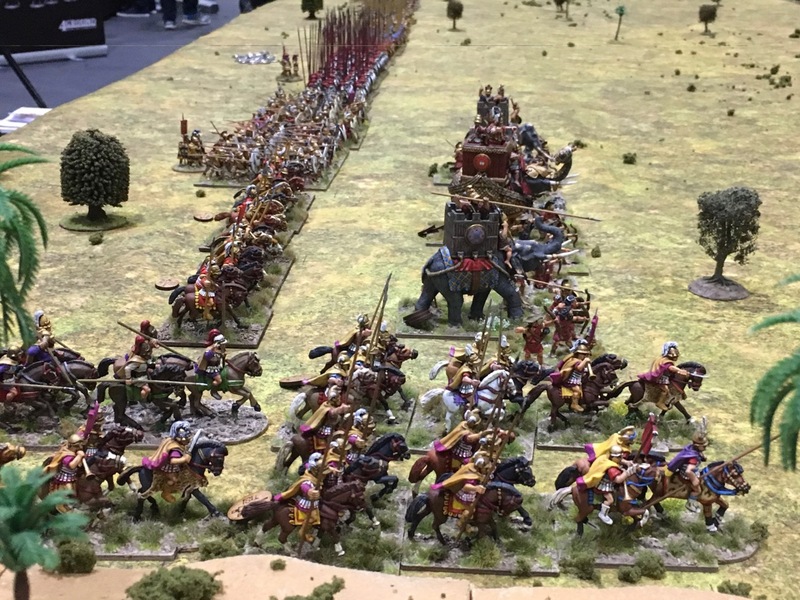 ‘Alexander: Conquest Fulfilled’ was the title of another hypothetical battle which saw the great Macedonian general lead his army on an invasion into China. 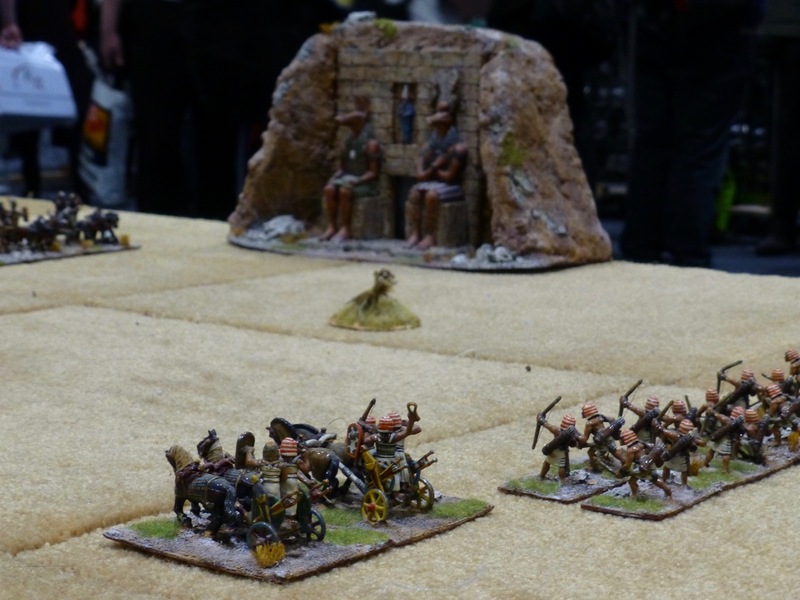 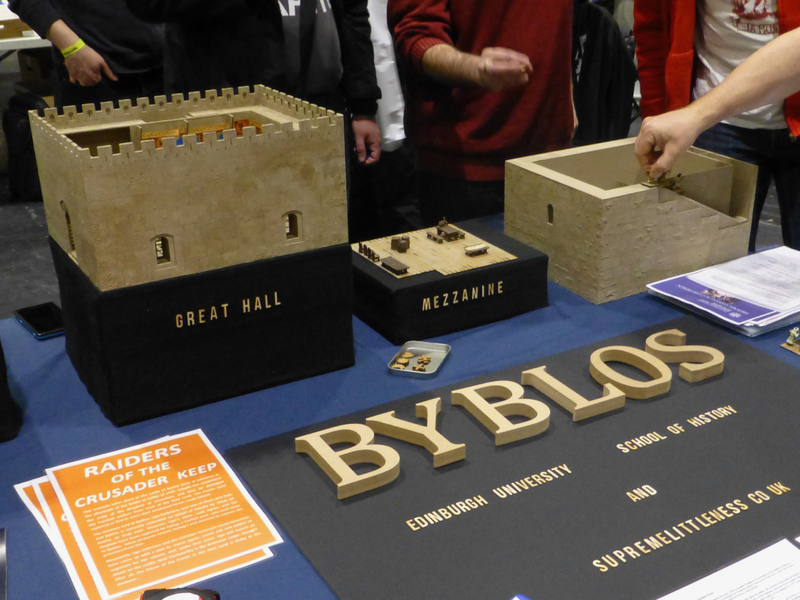 The University of Edinburgh and Supreme Littleness Designs staged ‘Raiders of the Crusader Keep’. 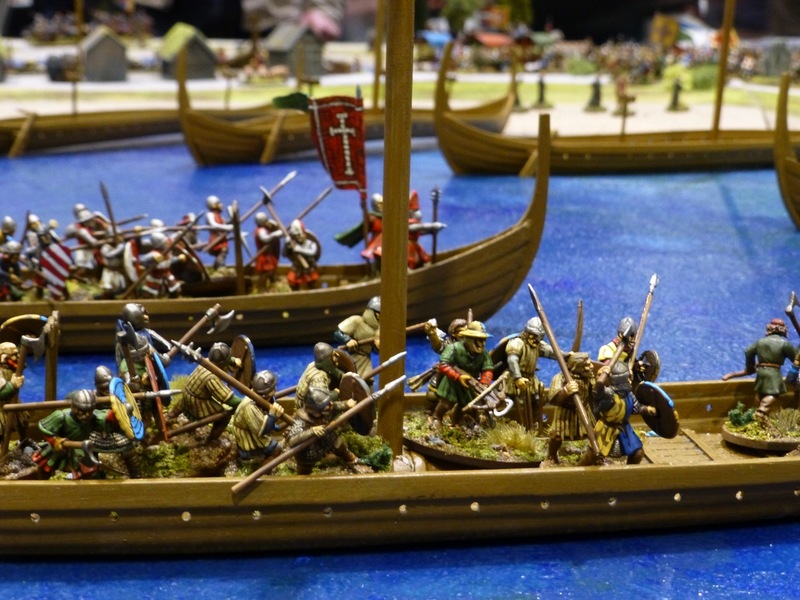 Based on medieval sources and archeological discoveries, it allowed to take part in fighting through a 13th century crusader castle at Byblos. 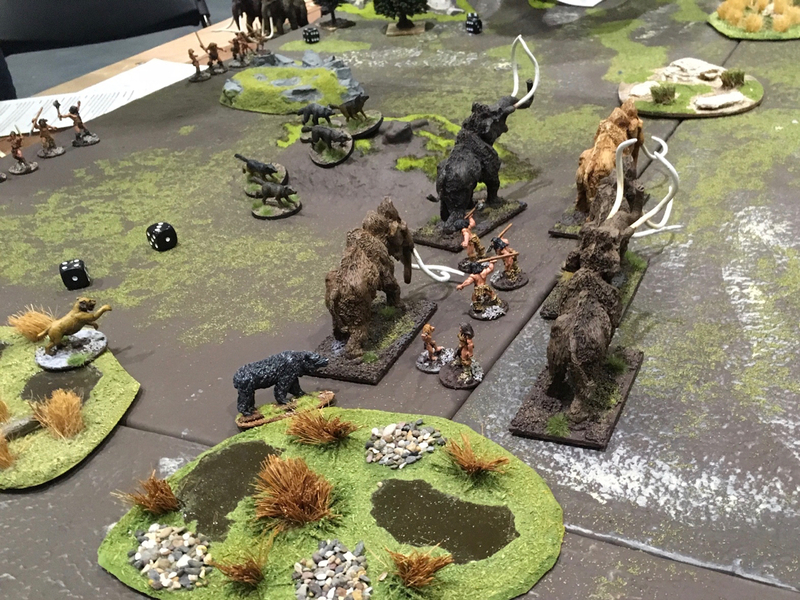 Well before the beginning of recorded history, the Wargames Association of Reading led on a ‘Mammoth Hunt’ while simultaneously having to fight off rival tribes and hungry sabre tooth tigers. 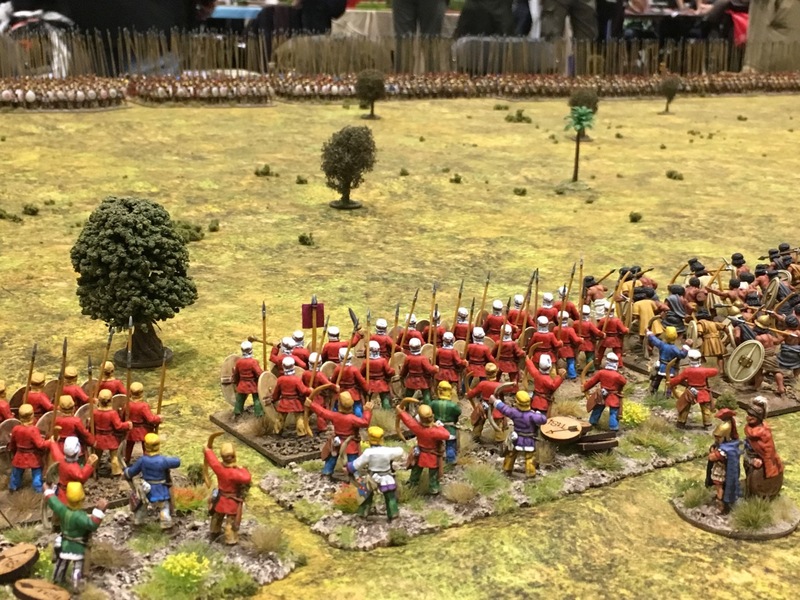 Jumping ahead to 1421, the Lance and Longbow Society fought the ‘Battle of Bauge’, which was a confrontation between an English versus a French and Scottish army. 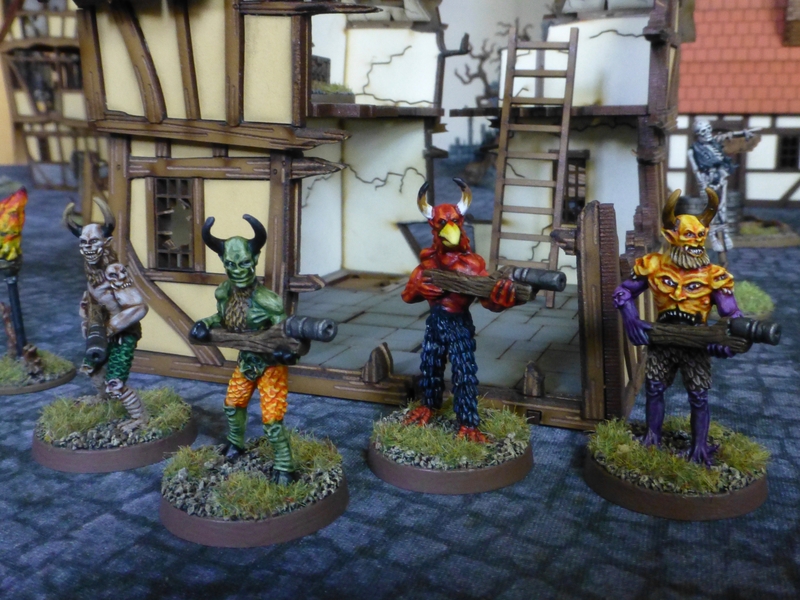 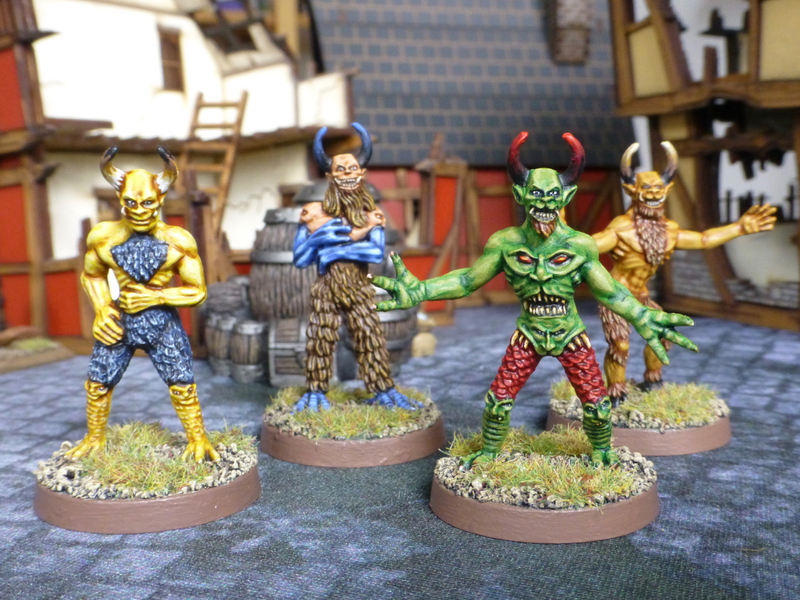 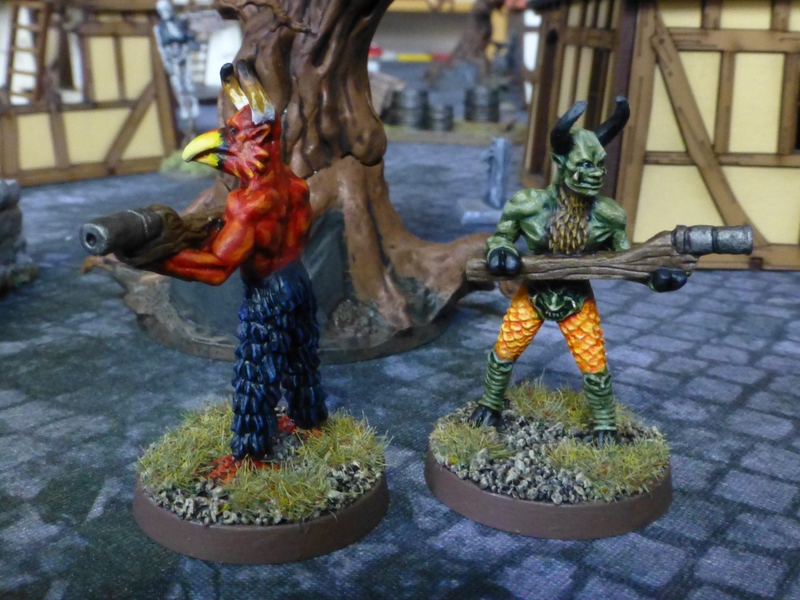 I have finished another four of the medieval demons produced by Antediluvian Miniatures. 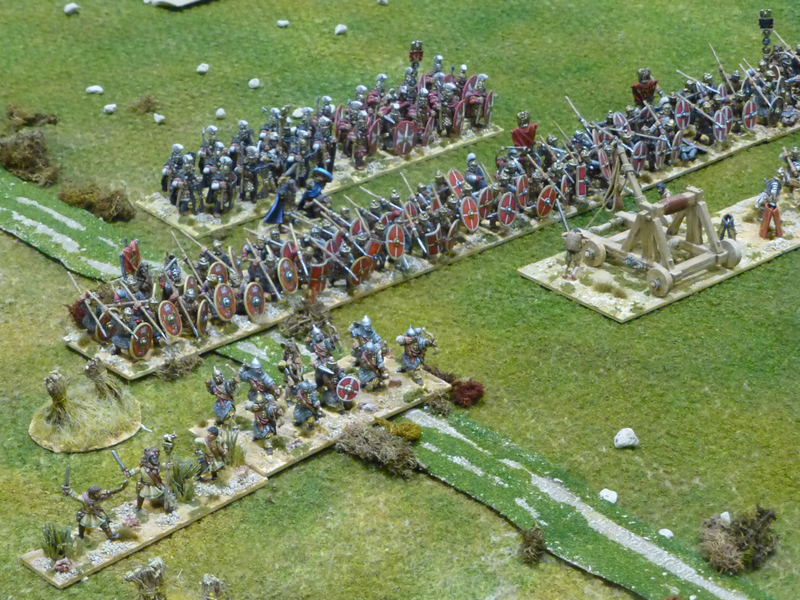 This lot is carrying handgonnes, a sort of cannon on a stick that originated as early as the 13th century. 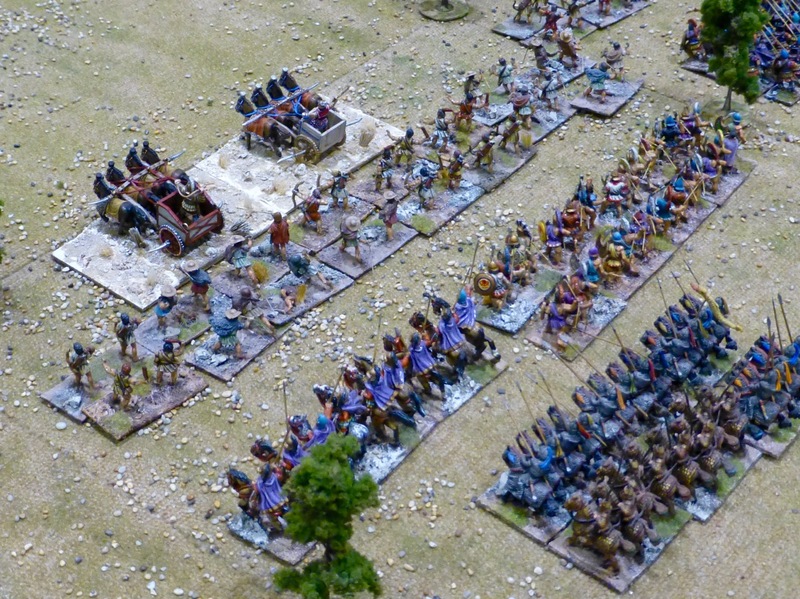 In game terms, where appropriate blackpowder weapons might be missing, I’ll use the crossbow rules to represent them. 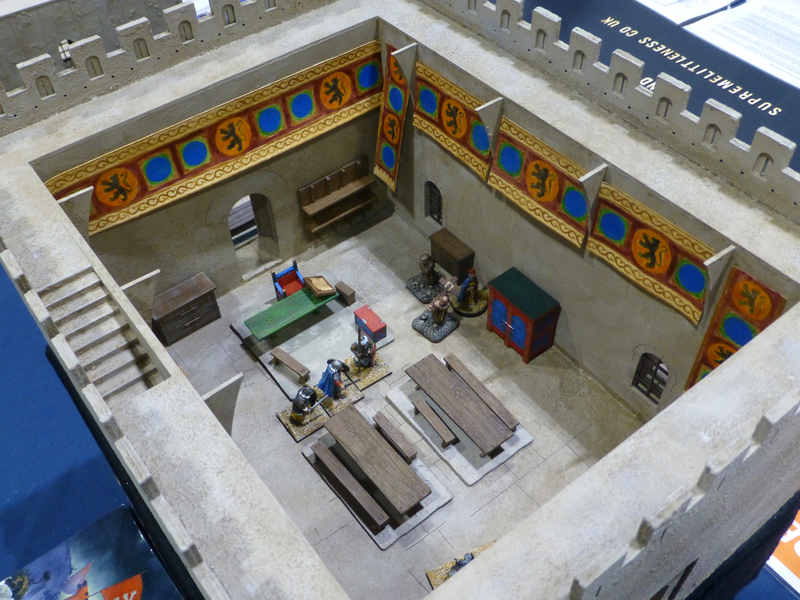 The Middle Ages were strange times and I am sure as hell glad not to have lived through them. 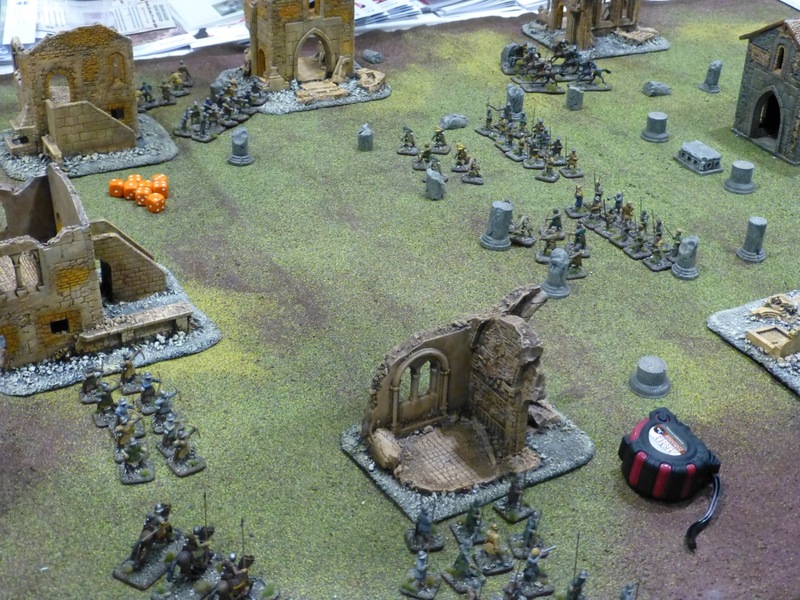 In fact, I am surprised how anyone could have lived through them. 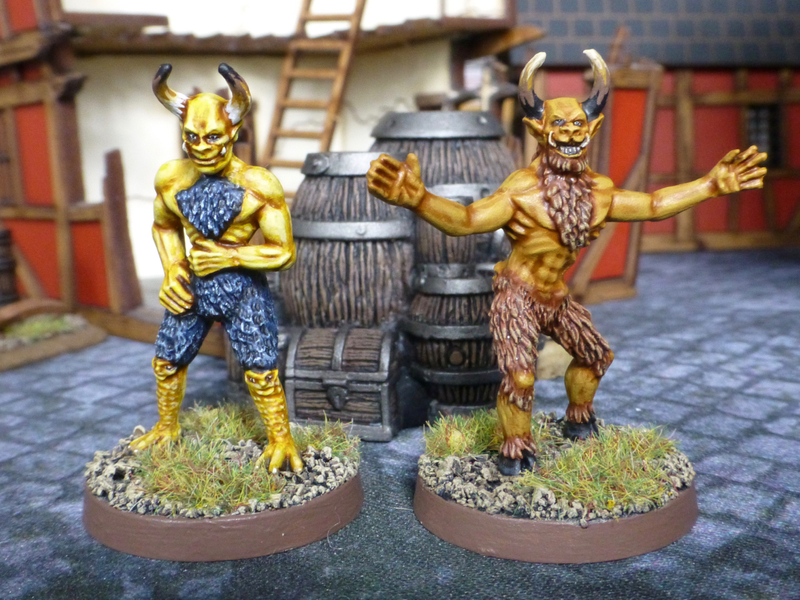 Alongside their medieval demonic legions, Antediluvian Miniatures also created other obscure entities from the illuminated manuscripts of yesteryear. 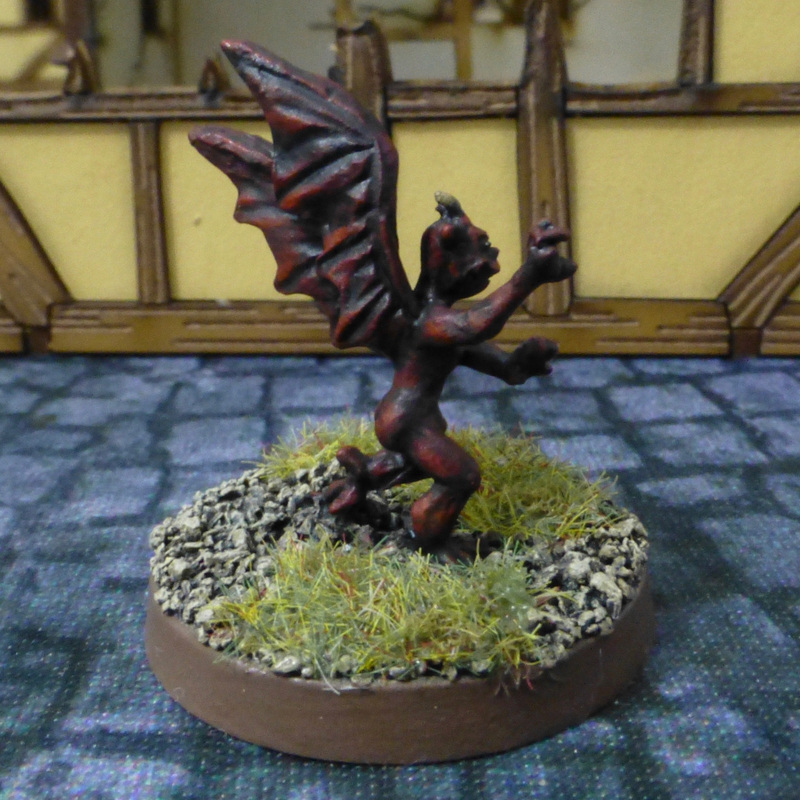 The imp is a miniature devil of sorts, hence I painted him in a diabolical red. 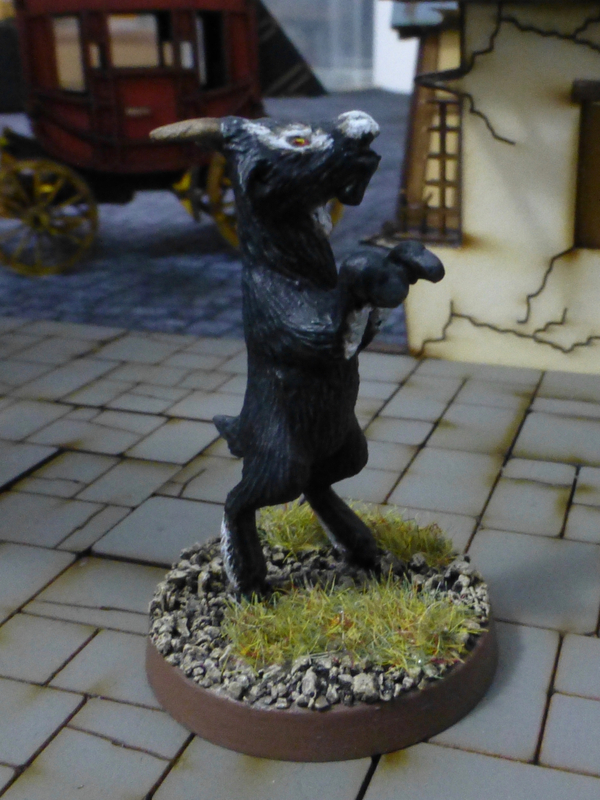 The black goat that walks like a man seemed like an even easier colour choice, but I decided to add some white markings for interest, and because they give it a slightly skeletal look. 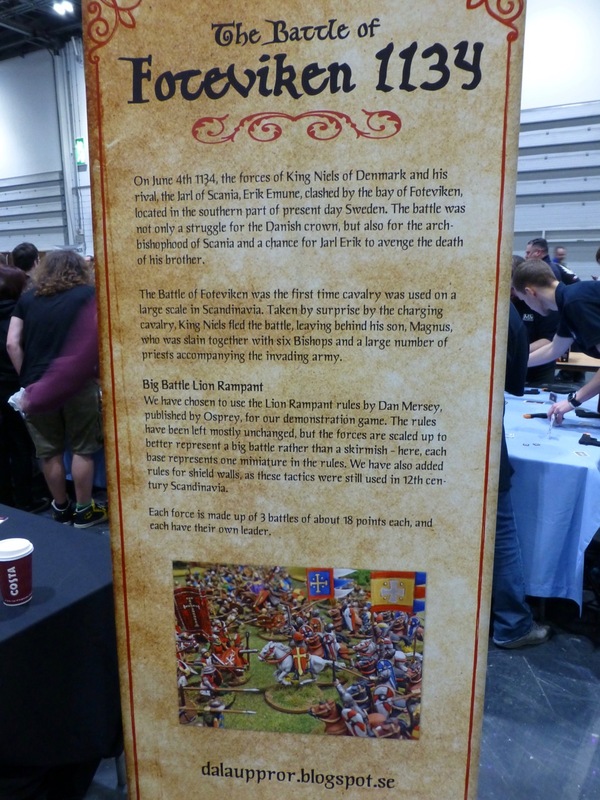 I did do a lot of image research on black goats that day. 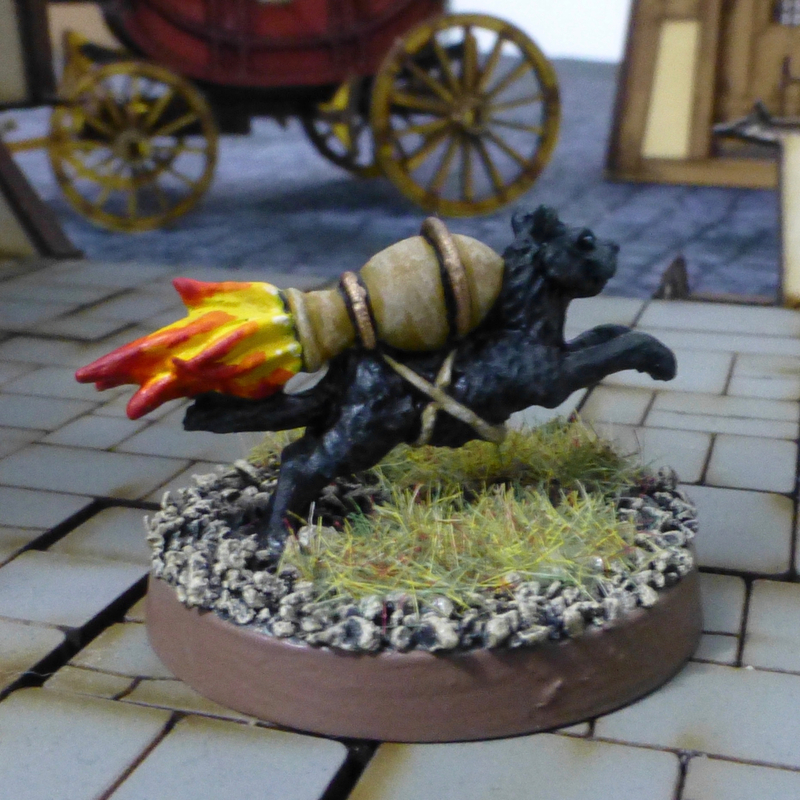 The rocket cat, which really is an incendiary cat that was supposed to light fires in besieged towns, was painted pure black to act as a contrast to the bright tongue of fire and pot on its back. 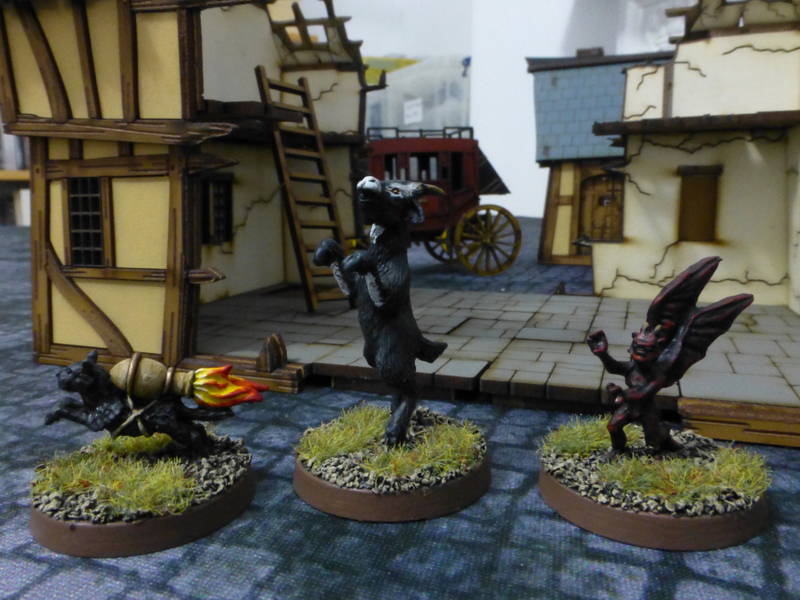 Also, a black cat seemed to fit with the theme, and I was feeling too lazy to paint patterns on such a small figure. 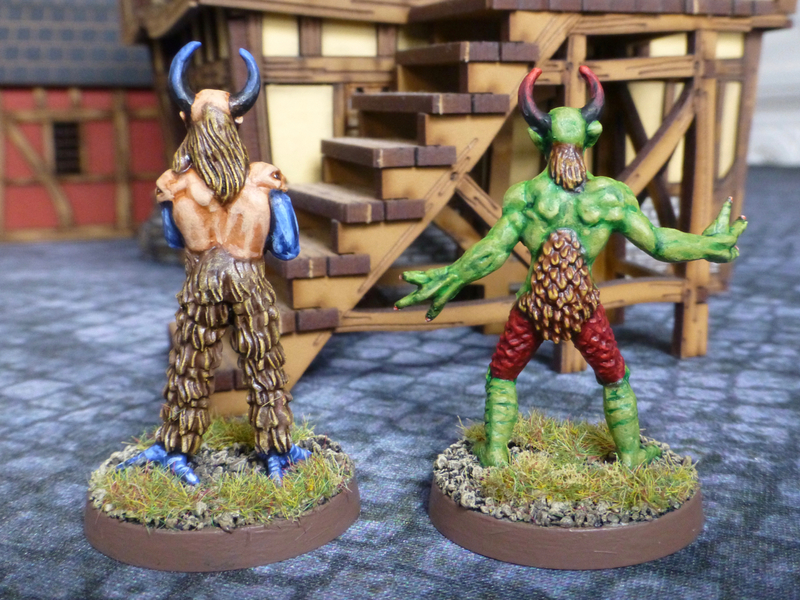 The set also comes with a classic witch on a broom which will make a nice hedge wizard. 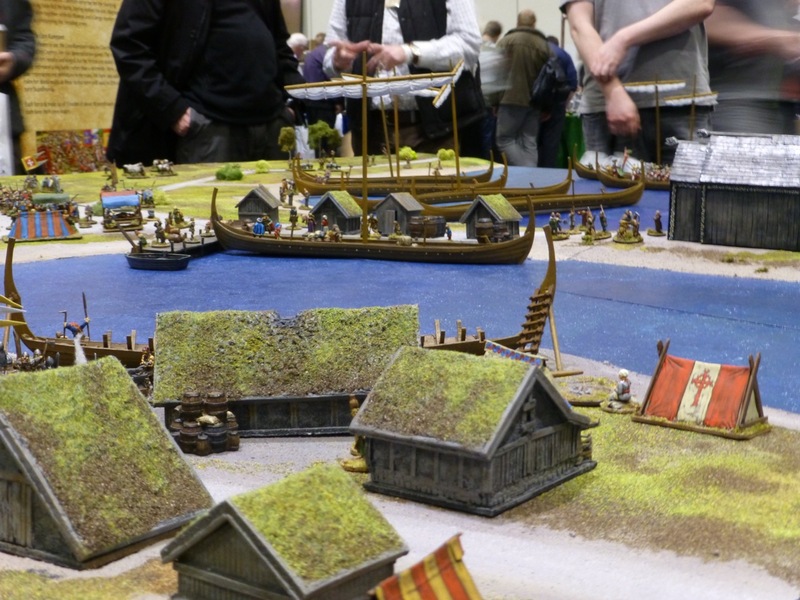 I am just not happy with sticking her on a plastic flying base, so need to come up with a scenic base solution to keep her in the air first. 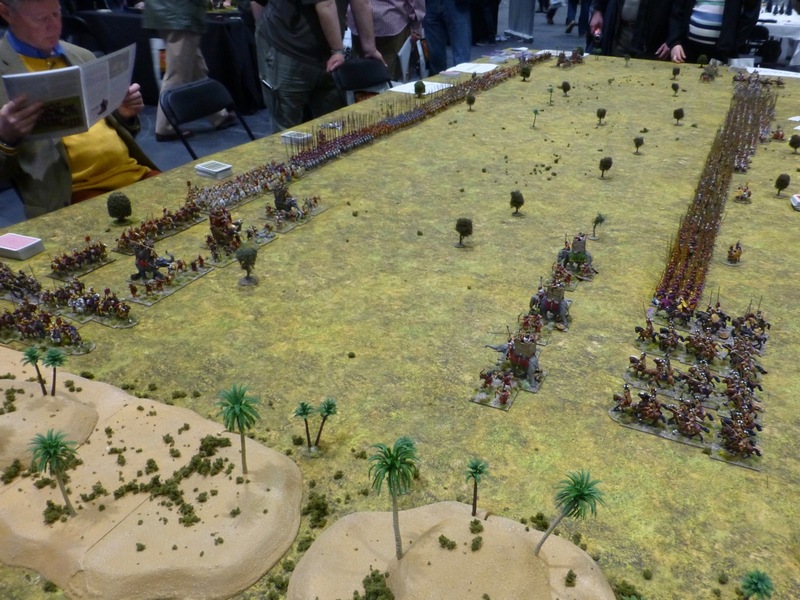 Simon Miller and the Wargames Holiday Centre brought this staggering array of phalanxes, cavalry and elephants to Salute to refight the Battle of Raphia in 217 BC. 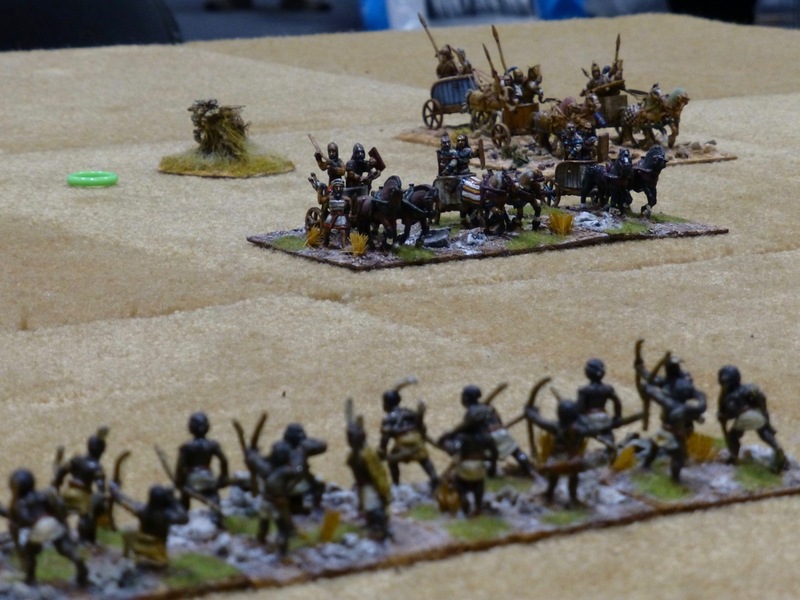 Thanks to undeadhighelf for the close up shots. 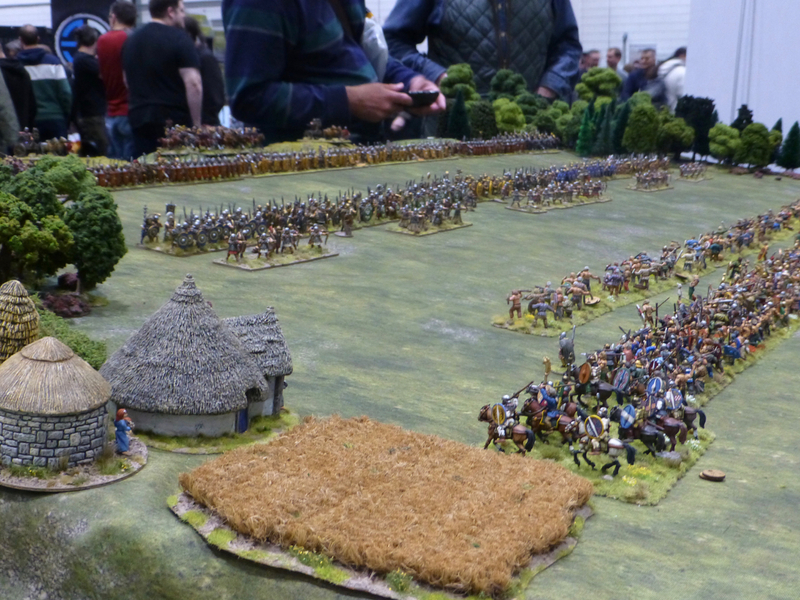 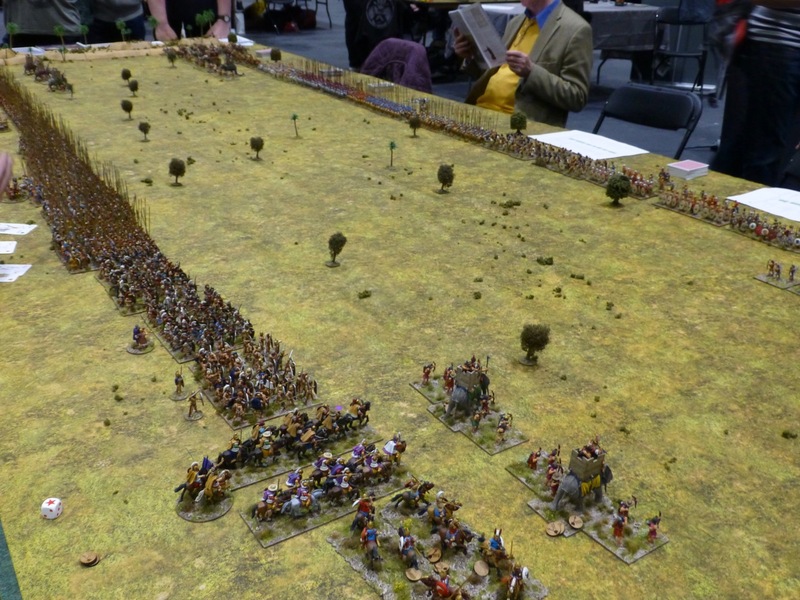 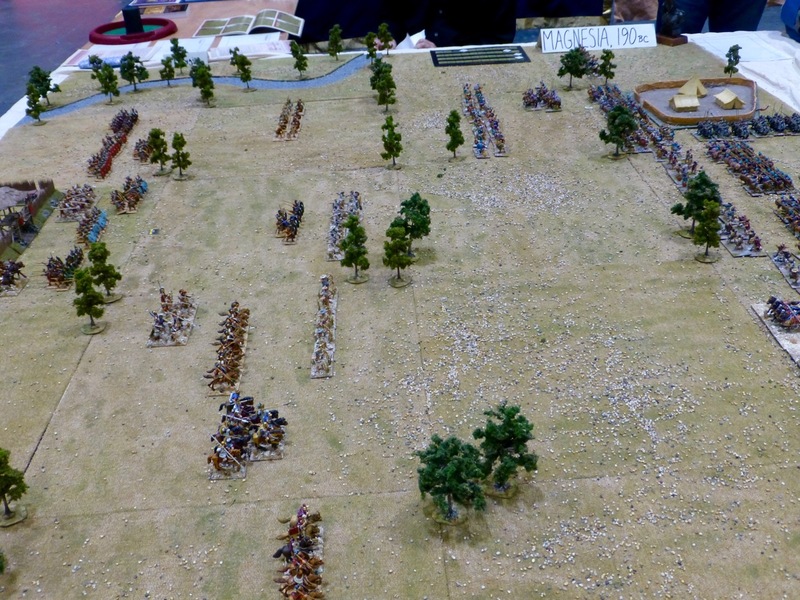 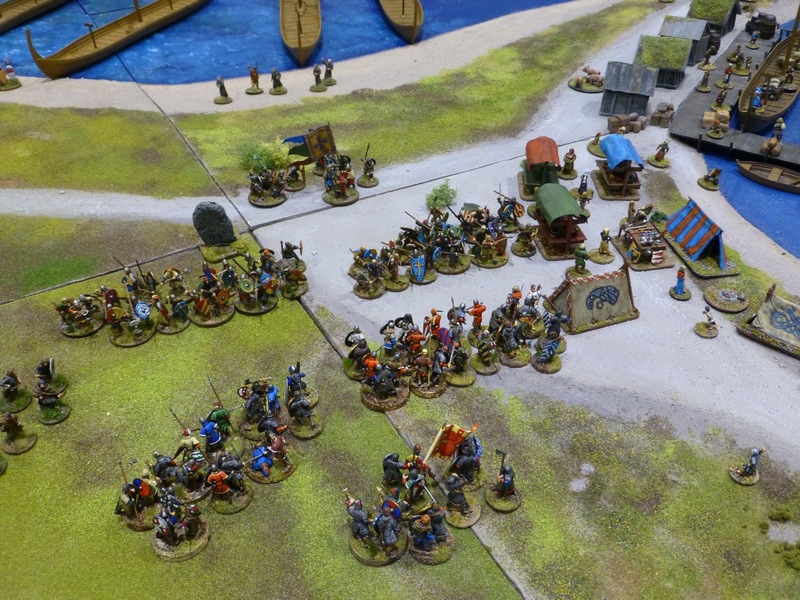 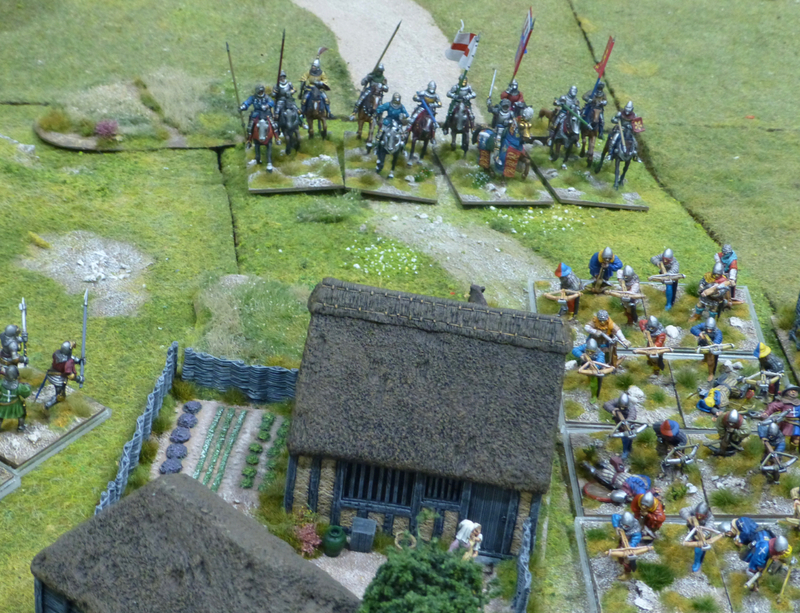 Photos of the battle lines clashing can be found here on Simon’s blog. 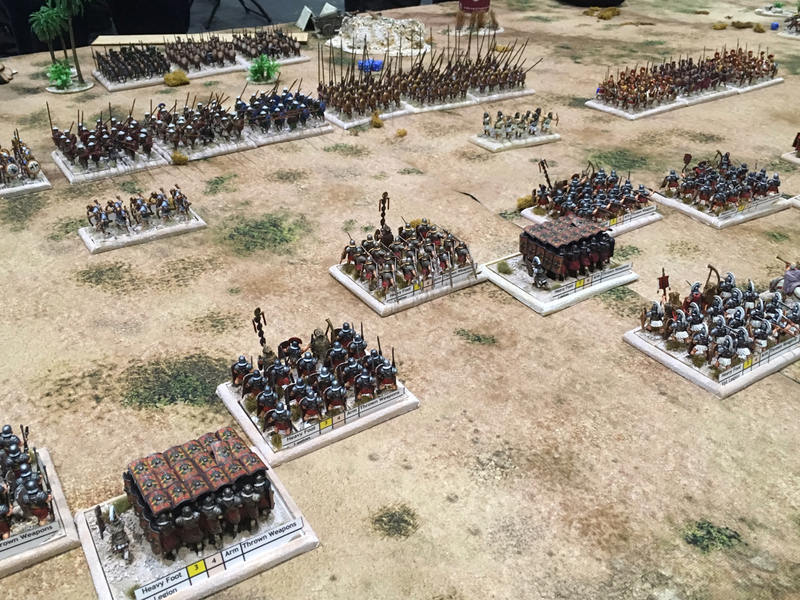 The Society of Ancients had the Battle of Kadesh as the theme for their game, reminding me to finish off my Hittite army at some point. 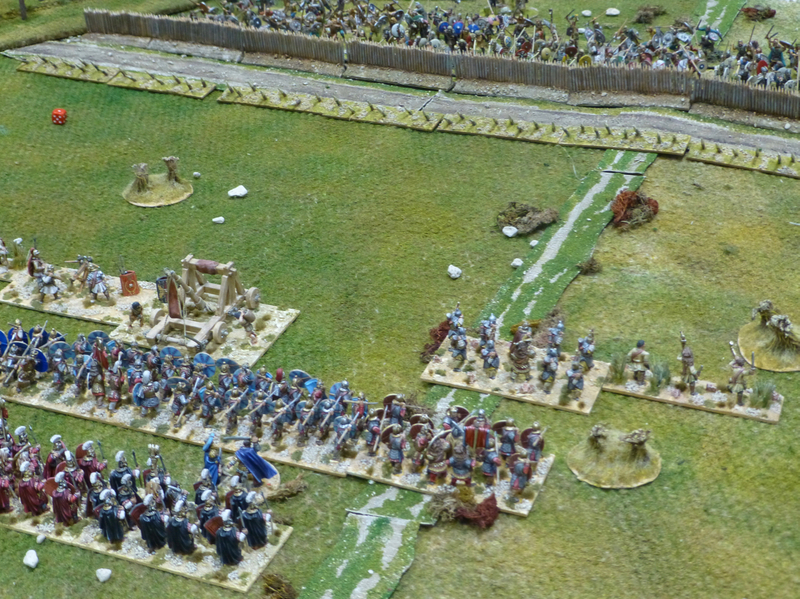 Taking their cue from a musical, the always original Tin Soldiers of Antwerp had the three houses of Rome clash across a hippodrome, bath house and amphitheatre. 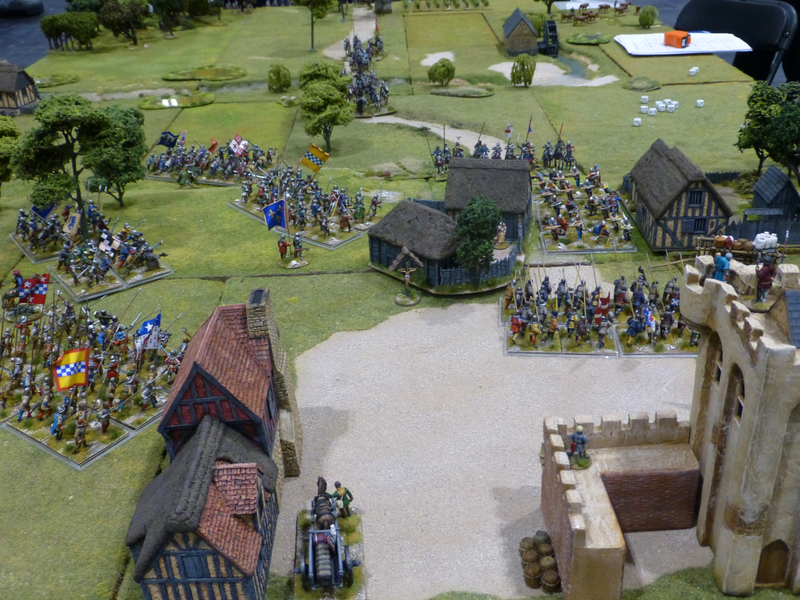 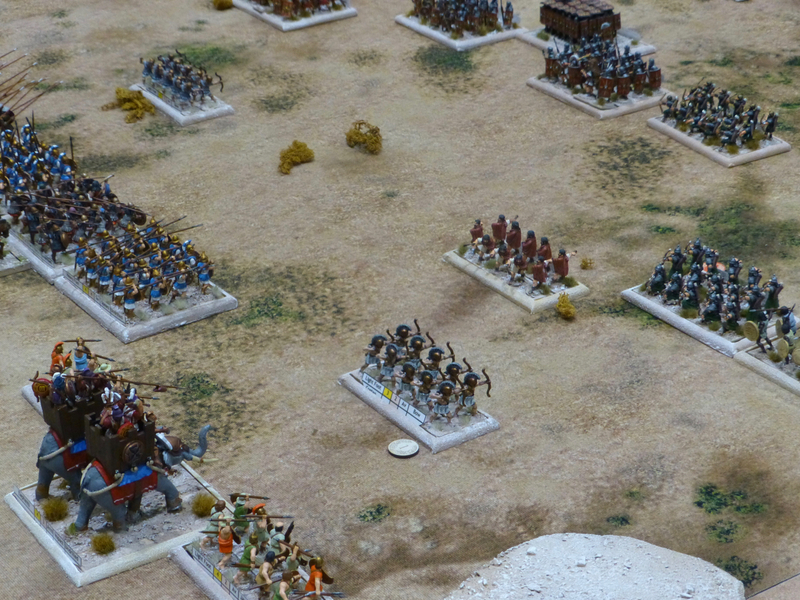 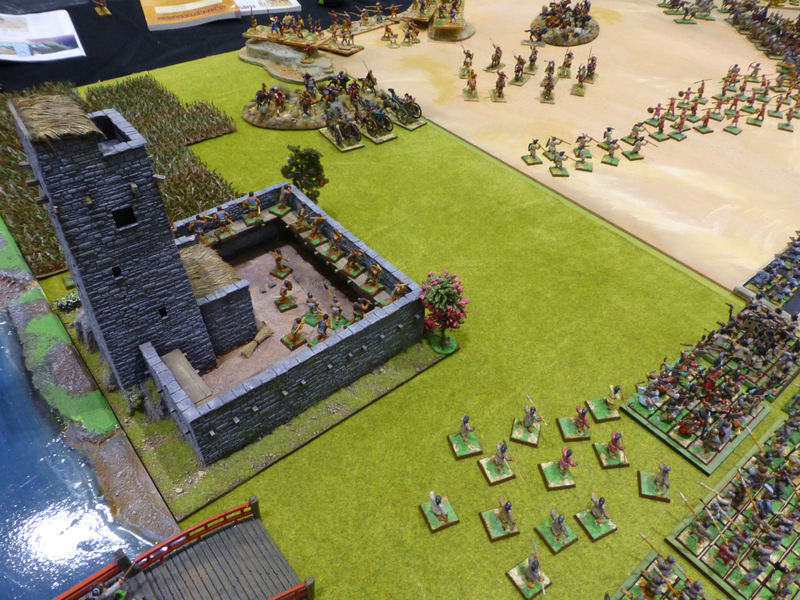 The Battle of Hastings was played out in 15mm using the Mortem Et Gloriam rules. 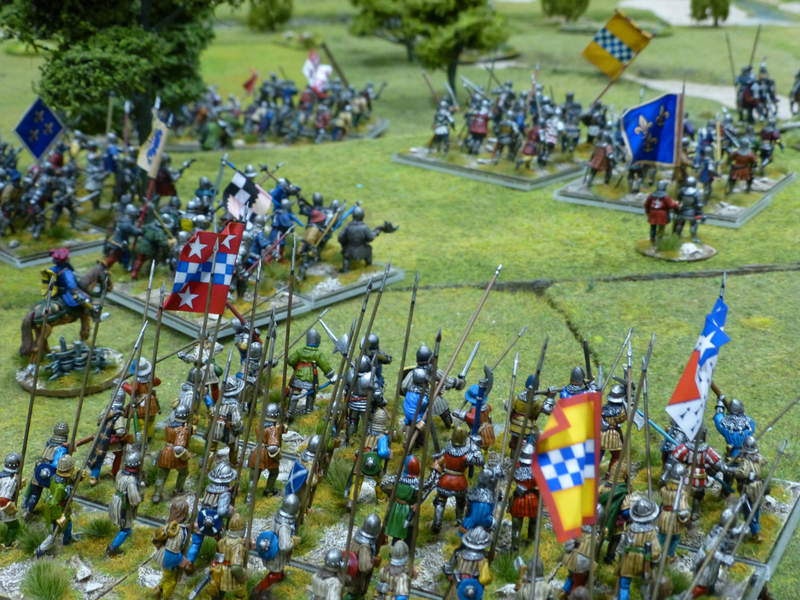 The School of History from the University of Edinburgh used Lion Rampant to fight the Battle of Lodi Vecchio in 1239.